"In the original The Crack In The Cosmic Egg I wrote that Lily were "A totally unknown entity, that existed, made one album, and just as quickly disappeared!" whereas now, thanks to Garden of Delights informative CD booklet we can now tell you much much more! Lily were never really "Lily" but were always Monsun (that's Monsoon in English) originating in the mid-1960's from a Frankfurt beat band called The Mods (featuring Michael Winzkowski, later of Orange Peel and Epsilon), going through various changes before gelling as Monsun in 1970. Recording a demo tape in Spring 1972, they so impressed Bacillus Records producer Peter Hauke that he promptly signed them up after witnessing them live at the Frankfurt Zoom Club in October. Peter booked them three days at Dierks Studio in January 1973. For some reason the big wigs at Bellaphon decided they wanted to promote them as a "glitter rock" band and with a more international flower-power name, hence they became Lily, all gleefully dolling themselves up for the chintzy cover shot. The Lily album was distinctly Bacillus Records fare, not unlike label-mates Nine Days Wonder and Message, almost like a hybrid of the two, notable for eccentric lyrics and angular fusion elements all carried by Dieter Dierks superb recording. But unlike those multi-national bands Lily were entirely German, and more offbeat in a bizarre Krautrocky sort of way, with oddly composed songs, strangely worded lyrics and such like, all in a complex jazzy prog. Generally the songs are woven within the structure, with the instrumental focus being led by excellent fuzz/wah saxophone, a Helmut Hattler type lead-bassist, and dual rhythm/solo guitars. 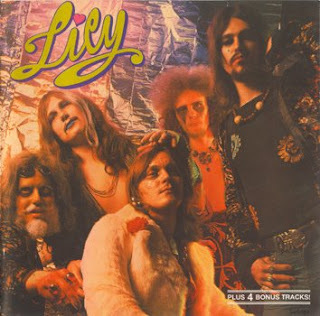 "Lily is not a name you'd associate with a German, jazz-rock inflected band whose vocalist often sounds a great deal like Jethro Tull's Ian Anderson. Seeing it, you might think it were the German answer to the UK's Lulu (who most know from her "To Sir With Love" song). And in fact, as the liner notes state at the outset, Lily was not the name the band initially used but rather Monsun. Lily was thrust upon them by Bellaphon records, hoping by giving them a "glitter image [to…] increase their chances of success." This is why on the cover they are wearing make up and women's clothes. Where Lily a glitter band? No, far from. Lily were Manfred Schlagmüller on drums and percussion, Wilfried Kirchmeier on bass and vocals, Hans-Werner Steinberg (tenor and soprano saxes), and both Manfred-Josef Schmid and Klaus Lehmann on guitars. Schlagmüller and Kirchmeier play synths on "Eyes Look From The Mount Of Flash," which puts snappy percussive effects early on and squelchy effects as the song ends. V.C.U. (We See You) was recorded and released in 1973, recording taking place at Deiter Dirks' studio. The band were given only three days studio time, only two of which were able to be used for recording. Vocals were left for the last day, and were, according to the liner notes, "recorded very quickly." This hurriedness shows in the unpolished nature of the pieces. Individual performances are good, but on some tracks the band seem out of sync. The one element that worked the least for me were the vocals of Wilfried Kirchmeier, at least at the outset, as they improve as the album moves along. In fact, the more he sounds like Anderson, the better they are. But given the time constraints, there was no time really to redo anything. If you can set that aside and listen to the band's playing, you'll find they were really quite good, especially drummer Schlagm¨ller (who is showcased on the best track on the album, the bonus track "The Wanderer." If you love and admire drumming, this is the track to skip to first – in fact, given the bass solo from Kirchmeier and the remaining performances on this instrumental track… you'll also want to skip to here first). Oddly, the best tracks on this album overall are the bonus tracks, which were presumably recorded at the same time as the initial tracks – nothing is mentioned in the liner notes (strange coming from the usually very thorough Garden Of Delights). These might have seemed too "commercial" in comparison to the other material ("The Wanderer" aside), but stylistically, they seem to fit right in, though to my ears they seem a little more polished. They are mostly instrumental tracks, though they aren't solely instrumental. The bonus tracks include the mostly musing blues-jazz piece "Chemical New York," the highlight being the tenor sax playing of Steinberg. "Adlerbar" has an almost "Whole Lotta Love"/"Cross-Eyed Mary" rhythm to it owing to the fat, throbbing basslines of Kirchmeier and the roughened, ballsy guitar, all with Steinberg blowing tenor sax all over it (sometimes in a harmonica-like fashion) – cool stuff actually. "Catch Me" is a more upbeat, groovy piece with more sax and guitar up front. Kirchmeier sounds a bit like Jim Morrison on this piece. In broad strokes, their sound is reminiscent of other jazz-rock-psychedelic bands of the period, certainly evident during the middle section of "Which Is This," which, if it were strictly instrumental, would be excellent – from the guitar solo to the saxes to the drumming. While Lily don't sound like any one band in particular, there were parts that reminded me of early Jethro Tull, as mentioned -- parts of "Which Is This," and "I'm Lying On My Belly (including 'Tango Atonale')" and "Chemical New York" (one of the bonus tracks) all of which suggest Anderson's gravelly vocal delivery on "Aqualung" … somewhat. Comparatively, "I'm Lying…" is more simply arranged piece, where the band seem to be playing more in sync with each other, putting the guitar in the lead -- that is until a solo section, with soprano sax tootling over chiming electric guitars. Other parts that made me think of The Doors, Led Zeppelin, and Santana ... but it might be truer to say these bands were all influenced by a single source, which was the American blues. "Doctor Martin" is notable for its treatment of Kirchmeier's vocals where echoes ripple out and some good instrumental work that immediate follows. At least on "Eyes Look…," it's Schmid soloing in your right ear, as his tone is said to be rougher than the clearing tone of Lehmann, who will be in your left ear. It is on the track that I first really hear Kirchmeier on bass, who, as I said, really gets to solo on "The Wanderer." OK this is a huge download - the disc runs 79 minutes and there's a pretty nice booklet - better get started, see you next week! well!! in fact this one is not so unknown, here IN BRASIL, We got a pleasure to ´see´ it in the vinyl era, and, I agree so much, it´s really differente from any other band, a well mix with jazzy and rock feel, thanks for this nugget. Thank you very much for this one!!! Awesome band, great post!